(diamond pattern stitch). This reinforcement system prevents side to side movement of loads even at speed. Available in 3 standard sizes and custom sizes. 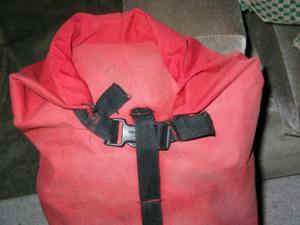 I usually carry a medium- which holds my tent, groundcloth, thermarest, pillow, and cook stove. 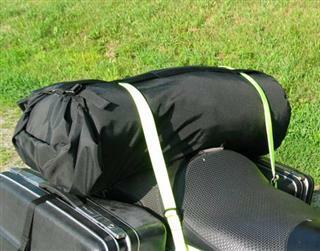 Unstrap it at the campsite, and toss it where you want to set up. Everything is there! Measure your stuff and shoot me an email so we can design something to meet your needs.